Principal Cast: Ian McKellen, Martin Freeman, Richard Armitage, James Nesbitt, Ken Stott, Graham McTavish, William Kircher, Stephen Hunter, Dean O'Gorman, Aidan Turner, John Callen, Peter Hambleton, Jed Brophy, Mark Hadlow, Adam Brown, Sylvester McCoy, Barry Humphries, Cate Blanchett, Ian Holm, Christopher Lee, Hugo Weaving, Elijah Wood, Andy Serkis. Principal Filmmakers: Peter Jackson, Director; Producers: Carolynne Cunningham, Peter Jackson, Fran Walsh, Zane Weiner; Screenplay: Fran Walsh, Philippa Boyens, Peter Jackson, Guillermo Del Toro from the J.R.R. Tolkien novel; Original Music: Howard Shore; Director of Photography: Andrew Lesnie; Film Editing: Jabez Olssen; Production Design: Dan Hennah; Supervising Art Director: Simon Bright; Set Decoration: Ra Vincent; Costume Design: Bob Buck, Ann Maskrey, Richard Taylor; Makeup and Prosthetics Supervisor: Jason Docherty; Special Effects Supervisor: Steve Ingram; Senior Visual Effects Supervisor: Joe Letteri. There are three package disc sets being offered of the theatrical version of the film. 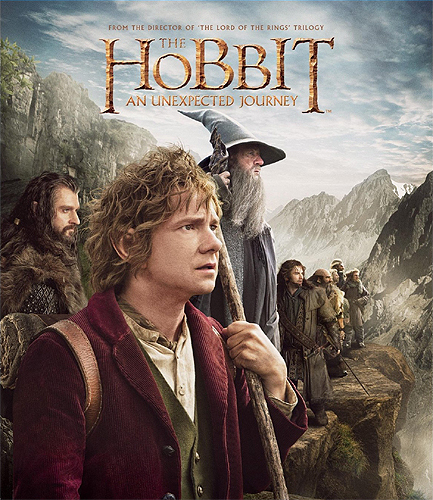 All three contain a DVD of the film and a second disc of extras that contain 10 production videos (129 minutes total), the featurette 'New Zealand: Home of Middle Earth' (6.35), six Hobbit trailers of about 2.35 minutes each and three related game trailers. The extras disc has spoken English only, but subtitle options of: English, French, Spanish, Portuguese, Chinese, Korean, Japanese and Thai. Except for the trailers, the extras are displayed 1.78:1 with a 2.0 DD soundtrack; the trailers are displayed 2.35:1 with 5.1 surround audio. The box contains a sheet with the code for accessing the "Ultraviolet" copy of the film for use on a mobile device. The DVD only version is a 2-disc set, whereas the 2D Blu-ray offering is a 3-disc set (1- BD, 2-DVD) and the 3D Blu-ray offering is a 5-disc set (3-BD, 2-DVD). All versions display the feature film in 2.35:1 format (anamorphic) with 5.1 surround language soundtracks in English, French and Spanish. However the Blu-ray versions have a DTS-HD 7.1 Master English soundtrack. After those basics come the additions and variations. The US and CA versions also have English, French and Spanish subtitle options with the feature film. The 2-disc DVD set is selling for $15-20us; The 3-disc set is selling for $20-30us; the 5-disc set sells for $27-40us. The UK release, in addition to English, contains spoken tracks in Italian, Spanish and Chinese. It also contains subtitles in English, Arabic, Bulgarian, Spanish, Dutch, French, Hebrew, Hungarian, Italian, Romanian and Chinese.n A Czech version was released with 5.1 language tracks in Czech, Russian, Thai, Turkish and Ukranian. Additionally it is listed as having subtitles in English, Czech, Chinese, Dutch, Estonian, Croatian, Indonesian, Korean, Latvian, Russian, Greek, Slovenian, Serbian, Thai and Turkish. There is also a French language version with spoken tracks in Chinese, Italian and English as well as subtitles in Chinese, French, Italian and Dutch. A German spoken language version with subtitles in English, Portuguese, Danish, Finnish, Icelandic, Norwegian and Polish was also released. As of November 2013, there are three extended edition disc sets being offered - a dvd 5-disc version, a 2D Blu-ray 3-disc version and a 3D Blu-ray 5-disc version. All three also contain a code used to redeem a digital download for tablets, smartphones, etc. This "Ultraviolet" copy is a standard definition, extended edition, copy of the feature only. For further details about Ultraviolet go to www.uvvu.com. All feature presentations are 2.38:1, with the Appendices and other extras presented 1.78:1. The US Blu-ray videos are all-region 1080p with English DTS-HD Master 7.1 or French DD 5.1 or Portuguese DD 5.1 or DD 5.1 Japanese spoken options. The DVD version spoken English is DD 5.1. All three versions include an optional feature commentary track with Peter Jackson and Philippa Boyens, in English. There are no subtitle options with the commentary, but you can run the feature subtitles while listening to the commentary. Subtitles options include: English, French, Spanish, Brazilian Portuguese, Chinese, Japanese, Korean, and Thai. The UK offerings contain the following subtitle options: English, French, German, Dutch, Finnish, Icelandic, Norwegian, Swedish. The organisational nature of the nine+ hours of Appendices and other extras is where some confusion can occur, given that the same material that is contained on two Blu-ray discs are spread over three discs with the DVD offering. If you want the organisational details on the Blu-ray versions, go to the review links listed below. DVD Izzy review of Blu-ray and DVD discs. 2013 - The Jameson Empire Awards (London) - Best SciFi/Fantasy Film and Martin Freeman, Best Actor. 2013 - Visual Effects Society Awards: Outstanding Virtual Cinematography in a Live Action Feature Motion Picture - Matt Aitken, Victor Huang, Christian Rivers, R. Christopher White.